It's said that there are three rivers that flow into Lyon: The Rhone, the Saone, and the river of Beaujolais wines that flows into the city's restaurants, wine cellars, and supermarkets. Lyon has traditionally been the best market for the winegrowers on the hillsides of the region that begins about 20 miles north of town. The Beaujolais and Beaujolais-Villages appelations comprise reds and whites and include the very finest AOC grand crus. As the name implies, the Nouveau is the first wine of the season, the first wine that can be called wine, harvested in September and aged (well, not so much aged as detained) in steel tanks for just a few weeks before being released to the public, ruby-red like black cherry Kool-Aid and sometimes tasting pretty much like alcoholic grape juice. Generally sniffed at by wine critics--one of whom famously said that drinking Beaujolais Nouveau was like eating cookie dough--the Nouveau nonetheless scored one of the greatest advertising coups in history when Georges Duboeuf decided to make the release of his least-prestigious wine into an Event. Hence the madness that ensues in the Beaujolais on the third Thursday in November. Every tiny village has its own festival, with tastings, live music, and dancing until all hours. Special buses run from Place Bellecour to Beaujeu and Villefranche every hour or so, ferrying wine enthusiasts and drunks alike to the festivities and back. 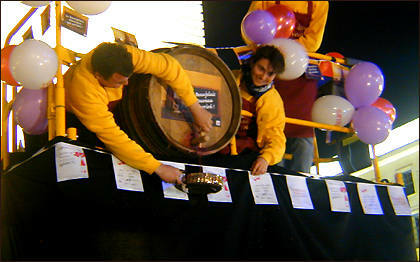 Around the world, wine shops and restaurants hold their own events; I seem to remember having a Beaujolais Nouveau on the Weaver Street lawn in Carrboro a few years back. But as Lyon holds a special place in the eyes (and pocketbooks) of the Beaujolais winegrowers, we get a little special treatment. The night before the Third Thursday, boats carrying giant wooden kegs of le premier vin float down the Saone from Beaujolais to Quai Tilsitt, a few blocks from here. The kegs are rolled off the boats and through the streets of Lyon, accompanied by torchlight and singing, to Place Bellecour [pic 1, not mine]. 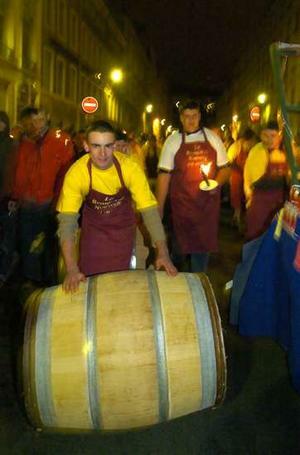 There, on the 12th stroke of midnight by the clock tower bell, the first keg is tapped, and the wine flows freely (and by that I mean free) to the people of Lyon [pic 2, not mine]. So Wednesday night around 11 I grabbed my camera and headed down to the quai, hoping to get some good shots. Some good pictures, too. But it was not to be: The quai was deserted, and Place Bellecour was quiet. Quiet except for some confused-looking people wandering around asking each other where the wine was. I eventually managed to glean (and this was backed up by an article in the paper the next day) that the combination of relatively low yields and an excess of foreign orders meant that the growers didn't have the kegs to spare to give away free to Lyon's oenophiles, bon vivants, and freeloaders. But all was not lost. The next day at the cafeteria at work, we had Beaujolais Nouveau to go with our quenelles and andouillettes. Then in the afternoon, my boss called everyone around to have some more...luckily this was toward the end of the day. Thursday night, the restaurants of Lyon were hopping, many with live music and most selling glasses of Bojo to people passing on the street from tents and bars set on the sidewalk. In case you were wondering, this year's Beaujolais Nouveau is very fruity--classically so, say the experts--and light-bodied as ever. With only a hint of mild disappointment. V. broke her toe this week--getting out of bed holding the baby, she swung her feet down and caught her pinky toe on an electrical transformer sticking out of the wall socket. So she's been holed up at home going stir crazy with her foot propped up while I run all the errands, take Boog to and from school, and so on. The good news is that we don't have to spend our whole Saturday afternoon on an endless shopping trip to Carrefour. The bad news is that I have a to-do list for today that runs two pages.